Rapids the morning of... Photo © by Judy Wells. 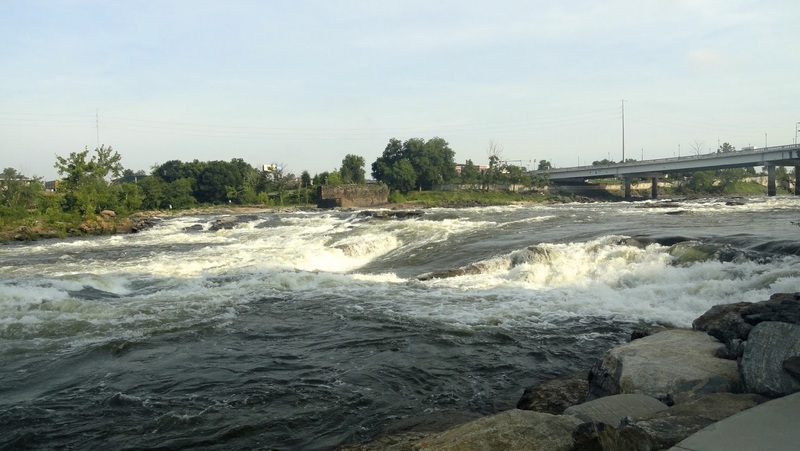 Twelve years ago the Chattahoochee River and the city of Columbus were in need of urban renewal. But, the private and public sectors worked together to change the tide - literally. Today, the city boasts the longest urban white water course in the world. The Good Girls investigated some of the 15-mile Columbus RiverWalk in the morning- a place where folks stroll, exercise, bike, and fish. When we got down to the area with rock studded “big water” I nearly changed my mind. Recent rains have swollen the river and the water truly rushes along. This gnarly section of class 4 rapids (would have been class 5 if the course hadn't been groomed to prevent rafts getting hung up in rocks) looked more powerful than I could handle. 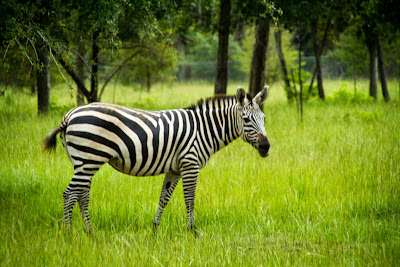 Certainly Judy would need to back out as her recent recovery from a broken foot might be in jeopardy. Debi and Ruth geared to go. Photo © by Judy Wells. However, when 1:30 came and it was time to don a life jacket and helmet, I wasn’t about to let this opportunity slip by. Ruth from Laurie Rowe Communications would join me instead of Judy. Casey, our raft guide from White Water ExpressOutfitters, was confident and couldn’t wait to give us an exciting adventure. Debi and Ruth learning how to go safely. Photo © by Judy Wells. After a general group briefing, we hopped into the van along with our oars and were driven to the loading zone. 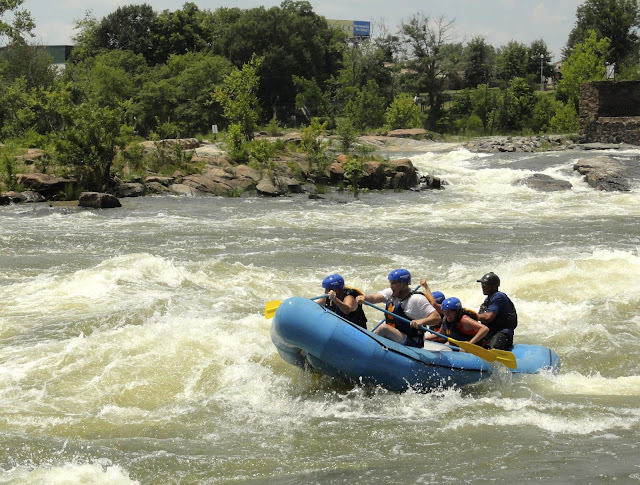 No sooner did we enter the Chattahoochee River (I love saying that name) than we encountered our first series of rapids. “Dig,” hollered Casey and the four rafters on board attempted to stroke together. The splash and spray of the river felt exhilarating as the sun was out and temperatures were running in the low nineties. Woo-hoo; bring it on. That was fun! We lazed through the next section, the river doing the work of pushing the raft forward. We enjoyed views of Blue Heron around the Habitat Pool, a man-made zone created by the river project engineers. Shoal Bass, which spawn in rough water, have returned now that the river churns with rushing tides. In all, two dams were removed from the river along with any sharp rock formations. Hitting high water. Photo © by Judy Wells. Casey mentally prepared us for the challenging lower course and let those of us on the raft decide how we wanted to approach. No wimpy rafters here, we choose the hot and spicy route. In high water, Photo © by Judy Wells. Oh my gosh, we had a wild ride as our raft bounced along, waves crashing in and over the sides. I screamed- but with delight not fright. I momentarily thought we would flip, as the raft seemed to fold up in the middle. Ruth fell forward while I slipped backward. But, with Casey at the bat, no one fell out and we soon recovered control of the course. Casey called for a high five of our oars and we were all elated. We were offered the option of running the course again, from a slightly shorter launching location. We all choose to return, so once again our raft bounced by the old brick denim mills at river’s edge and the newer convention center and historic downtown Columbus. How very cool to have what I think of as a rural adventure in the center of town. No need to drive hours to a park and camp out in order to get to a white water course. 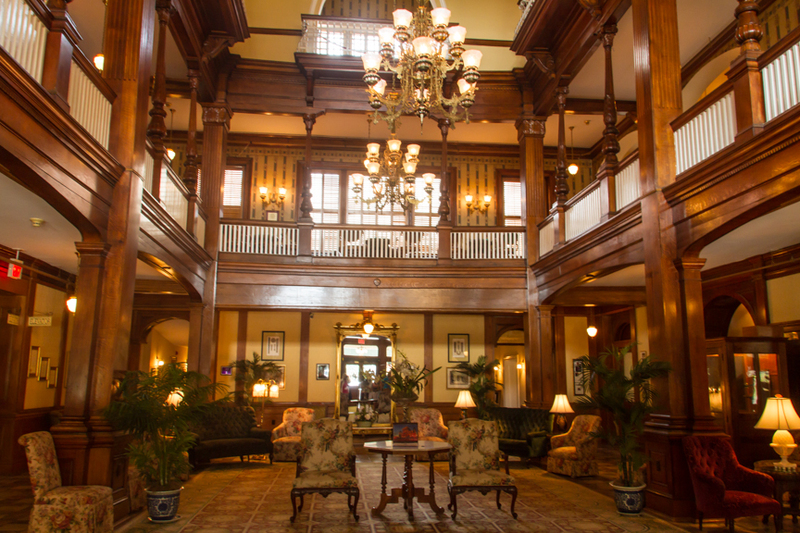 In Columbus, the adventure waits just outside your hotel or restaurant door. - Post by Debi Lander. Downtown Americus has the kind of buildings most towns wish they hadn't demolished. Brick, painted signs, touches of a more gracious time. Debi photographs displays at the Visitors Center, Photo © by Judy Wells. Inside the Visitors Center, though, it's as bright and shiny as today. Friendly faces, lively displays and interesting souvenirs join the usual racks of brochures. Good stop; favorite products, FROG and T.O.E. Jam; favorite button: "Bad decisions make good stories". 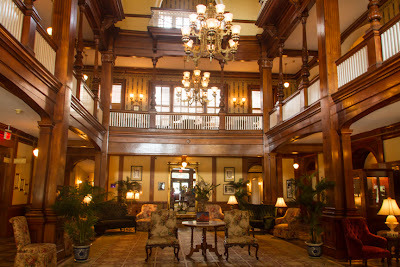 Lobby of the Windsor Hotel, Photo © by Debi Lander. Across the street is the elegant old Windsor Hotel. We were running late - what else is new? - but made time to take a look at the spacious lobby, Al Capone's old room, now the bridal suite, with its private stairway and the Rosemary and Thyme restaurant, cool in its white and blue color scheme. While enjoying lunch at Little Brothers - their pecan muffins are to die for but don't; eat them instead - hotel manager Sharad Patel told more about the hotel. 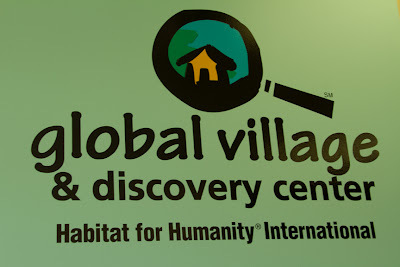 Then it was off to Habitat for Humanity's Global Village. Start of walk through sub-standard housing, Photo by @ by Debi Lander. After a brief introduction we headed out into the muggy, mid-afternoon Georgia heat and into examples of how the poor around the world, including the U.S.A., live. 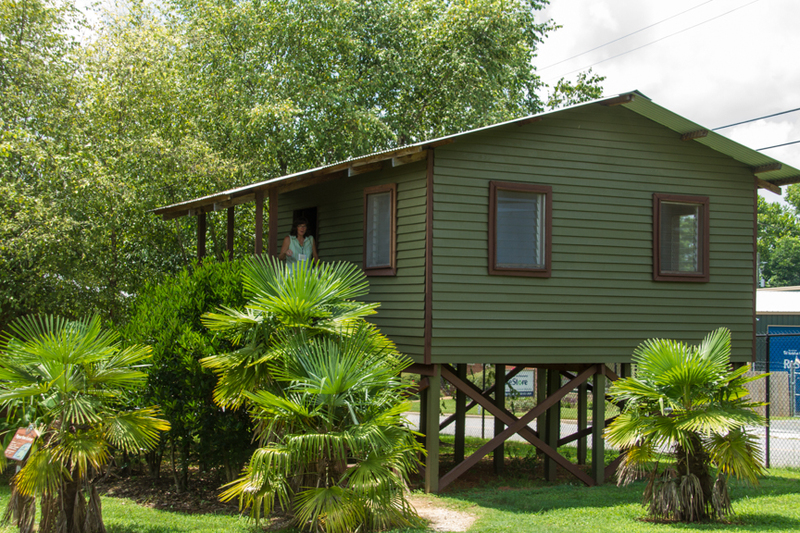 House designed to withstand the earthquakes and hurricanes of Haiti. Photo © by Debi Lander. 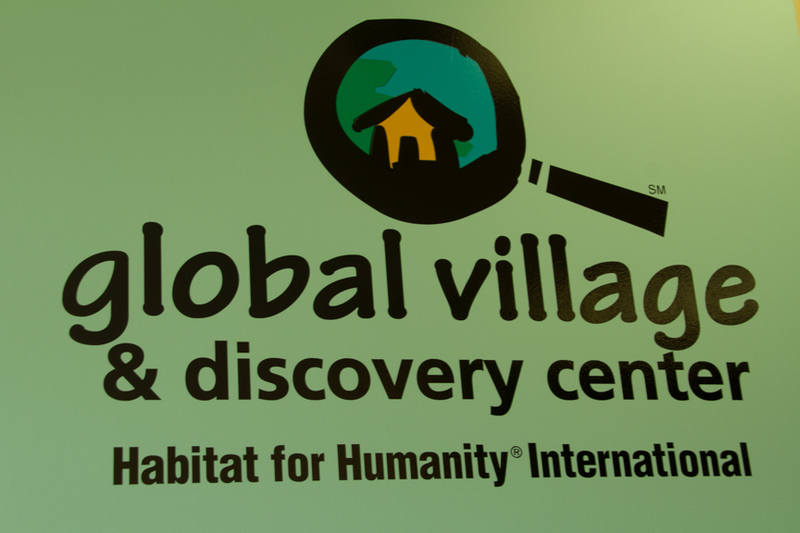 That segued into what Habitat for Humanity volunteers build for the lucky needy ones who've put in their sweat equity and can make minimal mortgage payments. Each design is built to accommodate a particular country's culture using as many local products as possible. House designed for Papua, New Guinea. Photo © by Debi Lander. Talk about planting a mustard seed. From the idea of one American couple, Linda and Millard Fuller, in 1976, in 80 countries more than 600,000 families have been helped by 200-plus affiliates worldwide. Driving into Plains you would think peanuts were grown nowhere else in the world. Main street, Plains. Photo © by Judy Wells. 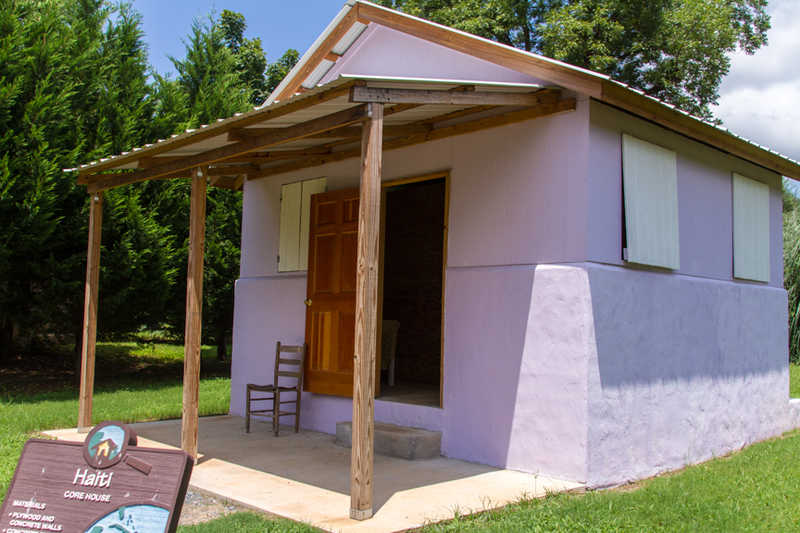 Of course it doesn't take much driving to get through Plains, a sweet little - emphasis on the little - town of one commercial block, peanut warehouses and some pretty homes. 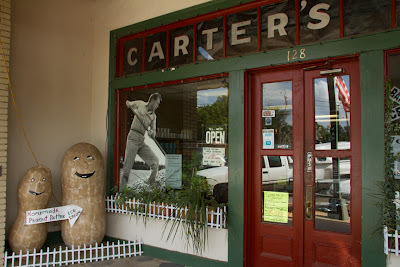 Oh, and the big peanut which we photographed and with which we posed. Trying to look presidential. Don't think we made it. Toured Pres. Jimmy and Rosalynn Carter's school from grades 1-11 (that's as far as it went) and tried out the presidential desk. The Carters' church. Photo © by Judy Wells. Drove by the "compound," ranger-eeze for where the Carters currently live and visited their church, where the presidential couple take their turns cleaning and mowing. 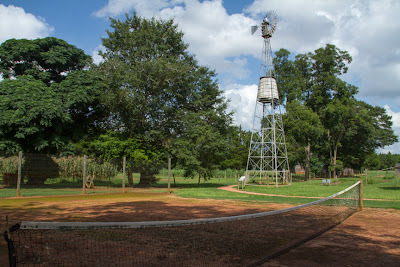 Carter family farm. Photo ©by Debi Lander. Stopped in at the family farm where Jimmy grew up. 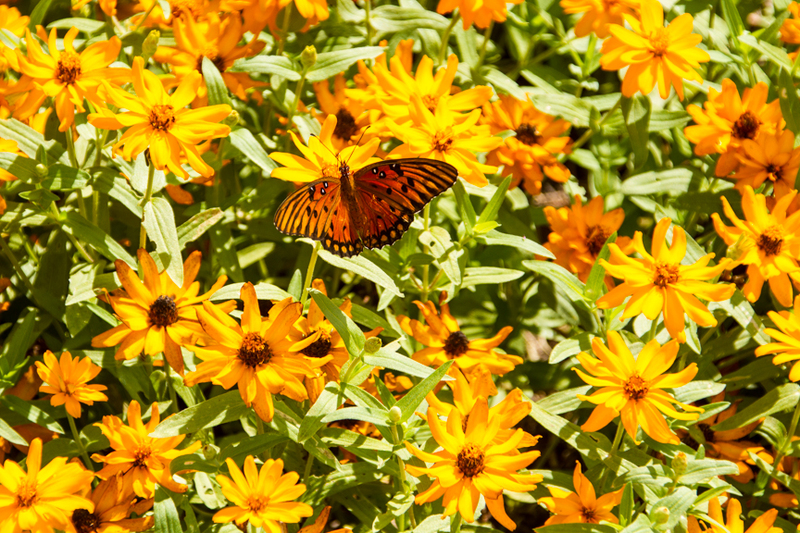 Flowers and butterflies thrive in Rosalynn's garden, Photo © by Debi Lander. Young Jimmy slept here. Photo © by Debi Lander. 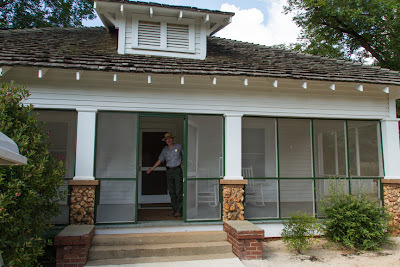 .... We toured the house, sampled the figs and pickling peaches growing in the yard and admired the tennis court and commissary Earl Carter maintained. Georgia farms, windmills and tennis courts aren't usually seen together. Photo © by Debi Lander. Then it was back to "downtown" Plains for a taste of the peanut butter soft-serve ice cream created by Bobby Salter at Plain Peanuts. If you want to see how many ways peanuts can be marketed, that is the place to go. Plain Peanuts is in the old Carter store. Photo © by Debi Lander. Sated with peanuts and up to the end of our patience with bothersome gnats, we hit the road back to Albany, where it was eat pizza, pack and prepare to get on with our invasion of Georgia. Andersonville cemetery. Photo © by Debi Lander. 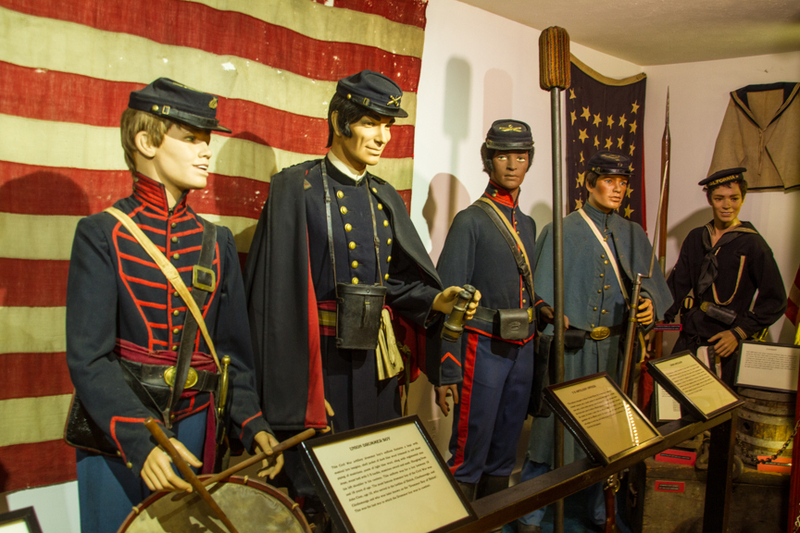 History, military and Civil War buffs. Descendents in search of family, former POWs, their families and soldiers in search of validation. Just curious. Most of the 130,000 to 150,000 who come to Andersonville, this National Historic Site, POW Museum and active cemetery, have a purpose. As Chief Interpretive Ranger Eric Leonard said, "This is a very, very reflective place. It's not where you come to picnic or play a game. Your experience depends on what brings you here in the first place." As travel writers, we came to see what was here, to learn what had happened and to experience and share with readers what it's like. What we left wanting was more time to see, learn, experience and reflect. That 13,000 people died here in 14 months, making it the deadliest place on American soil, is a tragedy but as Ranger Eric reminded us, the real tragedy is that it is not alone; there are more like it all over the world. There were 150 other prisons like it between the Union and Confederacy during the American Civil War. Outer courtyard sculpture. Photo © by Judy Wells. 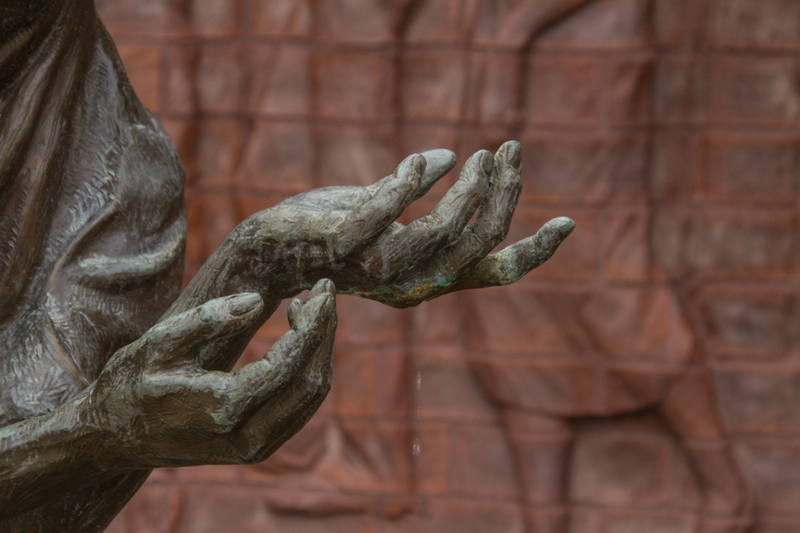 After seeing the museum's outer courtyard with its moving statuary of a prisoner with precious water dripping through his hand, we examined the infamous prison site. Photo © by Debi Lander. Looking across the expanse that was once Andersonville Prison. Photo © by Judy Wells. Originally 16 acres, at war's close it had been expanded to encompass 27 acres of hilly ground with a creek running through it. In all 45,000 men were imprisoned here over the 14 months of its operation; the highest concentration some 33,000 in July 1864. The stories of sorrow, cruelty, kindness, hope, achievement, infamy, bravery and cowardice are endless; we could have listened to our eloquent ranger recount them for hours. The ironies are as numerous. After the war ended, the last of three hospital buildings where so many men had died was taken over by New England female missionaries who used it as a school for the former slaves those men had died to free. Clothes worn by a prisoner at Andersonville Prison. Photo © by Debi Lander. Staring out across at that now empty expanse we tried to mentally populate it but the task was too daunting. We are lucky; such misery is beyond our experience. 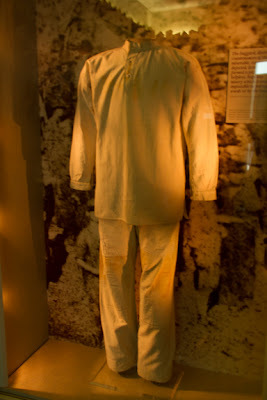 Hanoi Hilton cell. Photo © by Judy Wells. Sadly, it is not beyond the understanding and empathy of thousands of other soldiers who were and are captured and held prisoner during our other wars, which is where the POW Museum comes in. It makes tangible what those men endured from their morale to their torture, the agony of loved ones waiting at home and the indomitable spirit of the survivors. 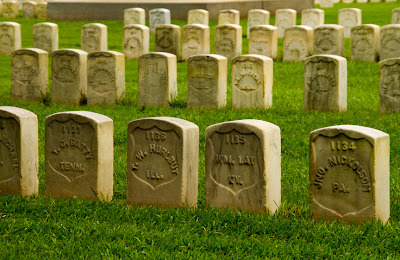 One small section of many at Andersonville Cemetery. Photo © by Debi Lander. 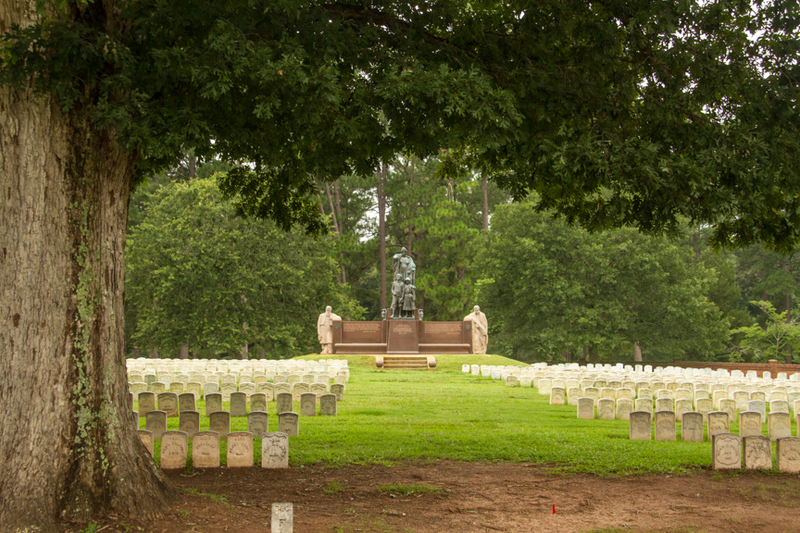 The cemetery where the dead of Andersonville are buried along with today's military and their spouses is 27 acres of silent honor and respect, idyllic in its green and treed expanse, silent statuary and row upon row upon row of simple headstones. Here you learn the story of the brave teenager Dorence Atwater who was responsible for keeping track of the burials as the war raged. He secretly copied the lists of numbered graves and the men buried in them and slipped it out. Clara Barton then used that list to find information for grieving families and to shame the military into erecting headstones identifying them. 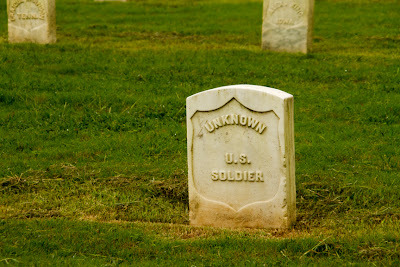 One of the few unknowns. Photo © by Debi Lander. The results are remarkable. Only four-percent of those buried here are unknown vs. the 40-percent unknowns of other campaigns. To say we left subdued is an understatement. The village of Andersonville, directly across the highway, was the perfect antidote. We were afraid it would be the usual hokey, commercial rip-off attraction that surround so many of our notable sites, but there wasn't a phony thing about it. Five of many uniforms at Drummer Boy Museum. Photo © by Debi Lander. We were met at the Drummer Boy Museum by its dedicated and indefatigable director, Cynthia Stormcaller, who took us inside and watched as our jaws dropped. 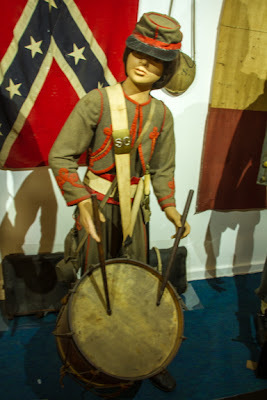 One of the finest collections of Civil War uniforms you will ever see, including one of only two known Confederate Zouave drummer boy uniforms known to exist. We were stunned by this unexpected find. Confederate Zouave Drummer Boy. Photo © by Debi Lander. 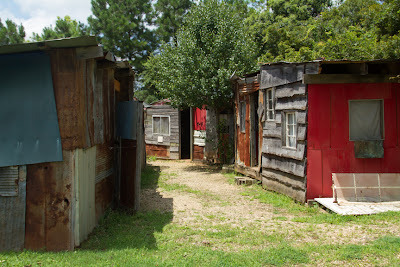 Andersonville Village.Photo © by Judy Wells. 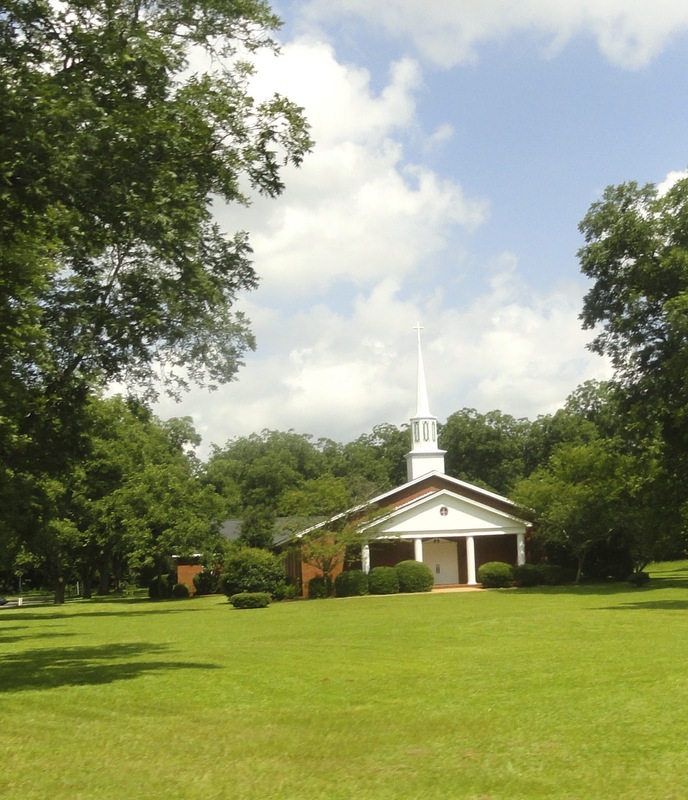 The village it is in is another jewel with its simple antebellum churches and buildings. It is here that the trains came to unload prisoners. 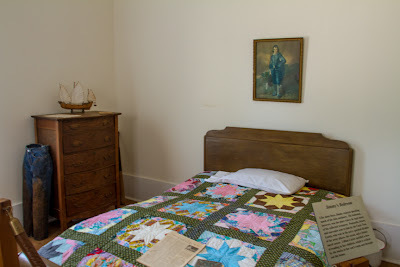 Then it was bustling with a hotel and 300 residents, including four families of freedmen. Today it is quiet, with 300 residents proud of their heritage and determined to preserve it. 1843 Andersonville Baptist Church. Photo © by Judy Wells. Filled with sadness for the past but hope for the future, like all travel writers we hit the road again to see some more. Of course we had a moment or two of levity. Wouldn't be the Good Girls without it, would we? 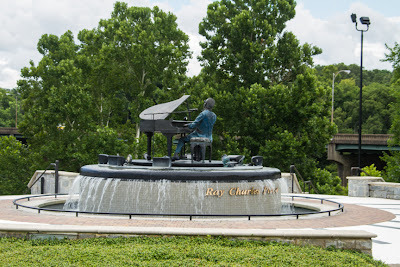 Ray Charles Plaza, Albany. Photo © by Debi Lander. We crossed the border into Georgia on I-10 Monday morning and were this close to O.D'ing on billboards - especially the "Strippers - Need we say more? Truck parking" sort - when we turned off at Tifton and headed west into billboard-free farmland. Children playing in the pop-up fountain. Photo © by Judy Wells. Albany couldn't come soon enough and when it did it was a breath of fresh air. Parents and children walking and biking along the Flint River, stopping to watch the bronze homage to Albany native Ray Charles pivot slowly around around its plaza as his recorded music played in the background. A few heading into the air-conditioned bliss of the Flint Riverquarium and a downtown deep in renewal. Our canoe trip down the Flint has been cancelled - the river is too high and fast - as was our jaunt out to Radium Springs, one of Georgia's seven wonders, for the same reason: Too much rain. Never mind. 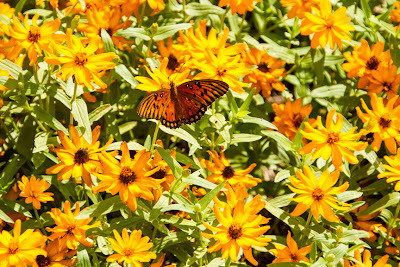 What we saw was in a very bearable high 80 degrees without the usual mid-summer mugginess. A fair trade in anyone's book, as we told our hosts with Visit Albany. 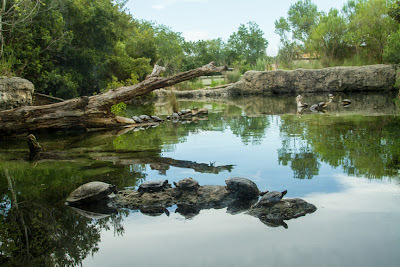 "The Pond," Flint Riverquarium. Photo © by Debi Lander. 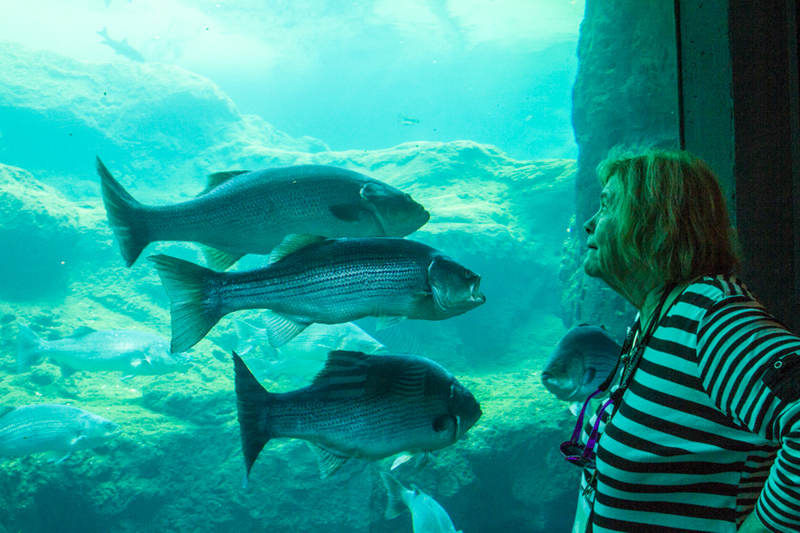 Judy watches fish in the "blue hole." Photo © by Debi Lander. The Flint Riverquarium was cool - and not just because of the air-conditioning. Centerpiece is the "pond," at 23' deep and 175,000 gallons one of the largest open-air tanks in the country. Turtles sunned, fish - bass, carp, golden sturgeon, flat-head catfish - swam and we watched. Gulf toadfish. Photo © by Judy Wells. Smaller tanks housed denizens from the world's rivers - Gulf Toadfish, spotted Wobbegong sharks, batfish and cichlids from the Rift Valley, Africa's version of Darwin's finches, among the more exotic examples. There's even Moonshine, an albino alligator. There's also an aviary. 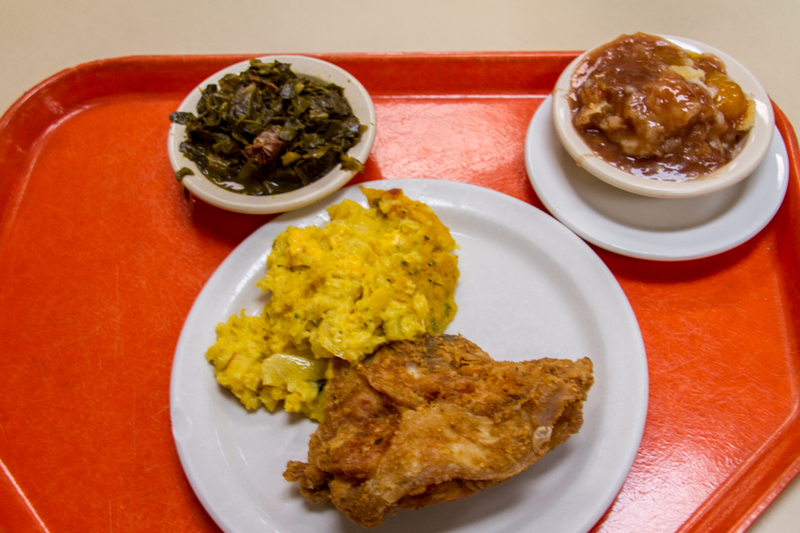 Fried chicken, squash casserole, collards and peach cobbler at Carter's. Photo © by Debi Lander. 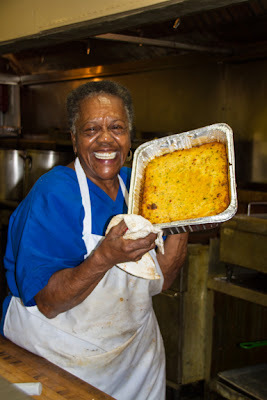 Miss Lucy Phelps and her squash casserole. Photo © by Debi Lander. After a caloric break for soul food at Carter's, where Miss Lucy Phelps' squash casserole is a work of sublime art, we continued in the wildlife vein with a trip to Chehaw, a park with a BMX course, disc golf, canoe and kayak launching facilities, primative and RV camping and TV zoo man Jim Fowler's vision of what an exotic animal park should be. Eland. Photo © by Debi Lander. Zebra. Photo © Debi Lander. 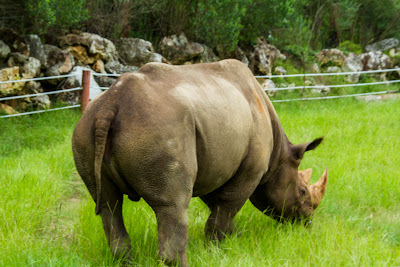 Sam Houston, a black rhino. Photo © by Debi Lander. Meercat on watch. Photo © by Judy Wells. 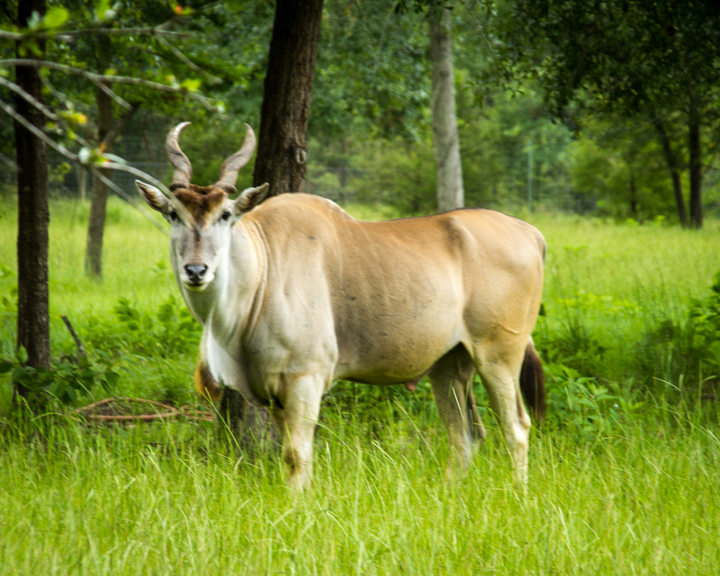 On a veldt drive we met zebras, elands, impalas, gnus and ostrich, after which we were mesmerized by meercats, Sam Houston the black rhino, emus, bashful bears and a female kangaroo whose pouch was overflowing with a lazy joey. You'd never know a city was just down the road. Grouper at Catch. Photo © by Debi Lander. 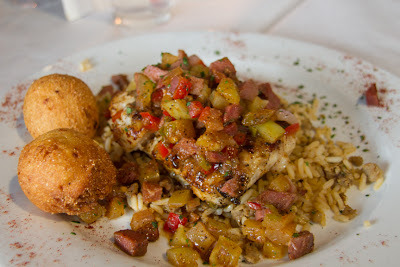 Girls are still happily burping from our fish dinners at Catch) and real southern hospitality. Judy, who lived in Albany from 1st through 3rd grades, also learned that you can go home again. Most of it will have been replaced, but some remnants will still be recognizable. Memories you didn't know you had will start flooding back and coincidences pop up like tree frogs after a rain. left a maximum of one-degree of separation between past and present. Well worth a tedious trek on an interstate lined with boring and unsightly billboards. The Good Girls in the Badlands invasion of Georgia has begun. Join us for the rest of the ride. We'll try not to burn anything down.